Every few months the SEO world along with all of their Monday morning quarterbacks go into a frenzy about Google algorithm changes. Much of the panic and doomsday scenarios could easily be remedied if industry “professionals” followed SEO best practices. Just try a search of “SEO is Dead” or “Google Algorithm Changes” and you’ll find a plethora of news articles and blogs lamenting the death of SEO. SEO is alive and well. If you own a small business and want to rank well on Google search, you simply need to create an aesthetically pleasing and content rich website that follows SEO best practices and steer clear of unethical practices that could leave your site with a search ranking penalty. What the Heck is a Penguin Penalty? 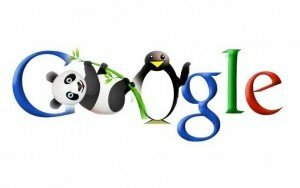 The Google penguin update came on the scene in April of 2012. The purpose of the update was to penalize sites who sought to get an advantage by producing unnatural links that point back to the site. Typically, a site is penalized on a particular keyword that has been linked unnaturally around the web. A website with a penguin penalty can still rank for other keywords and will not be penalized universally. To my dismay, I’ve had a few clients come to me recently with a Penguin penalty due to an unscrupulous SEO company they’ve worked with. If you or your SEO company have hyper-linked a particular keyword on low quality websites, Google will find it and they will penalize you for it. For example, if you own an engineering firm and your hyperlink appears on low quality foreign gaming sites and pages about baking cookies, you’re probably going to get a Google Penguin penalty. I’m working with a client at the moment that appeared on the first page of Google for a highly competitive keyword about a year ago. Slowly but surely, the primary keyword started to decline over the course of several months. After they hired us, we did an extensive link analysis and found spammy links on a number of low quality sites and of course, the primary keyword was used as anchor text. We’re now working on helping this client recover from the Penguin penalty by following the Google Webmaster Guidelines. Each page of your site should include a minimum of 300 words. 450 words is recommended. Do not spam your keyword multiple times in the content. Maintain a keyword density of 1-3%. Do not include an over-abundance of ads on your site. Duplicate content will get you in trouble. Use original, unique content. Get listed on trusted directory sites like Yelp, Yahoo Local, Bing, and Superpages. Make certain your business name, address and phone information is consistent on all directory sites. If you own a small business that has trouble keeping up with the myriad of Google Algorithm Changes and you’d like to spend more time focusing on your business, drop us a line so that we can learn more about your online marketing objectives.